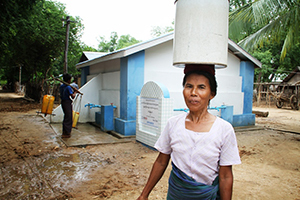 The need for improved access to water in Central Myanmar, known locally as the Dry Zone, has been known to the international community for decades. 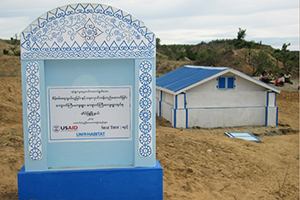 In late 2010, UN-Habitat conducted a thorough assessment of knowledge, attitudes and practices in regards to water, sanitation and hygiene in Wundwin Township, Mandalay Division (Dry Zone). Access to sustainable sources of safe water is a critical development and humanitarian issue, and an issue that cuts across each component of the Shae Thot program: sufficient, potable water will improve maternal and child health and will allow community members to better address livelihoods issues. Women are limited in their abilities to engage in either entrepreneurial or agriculture activities, for example, if they must spend many hours each day collecting and hauling water. The project will cover approximately 1,000 villages. The project activities centre on improving water infrastructure through the use of innovative but low-cost technology and the application of locally available materials and supplies. It increases water resources, improves water quality, enhances water storage capacity and provides greater water access to the communities concerned. The project aims at reducing the suffering and death among the people of Central Myanmar and an urban poor neighbourhood in Yangon region. The project concentrates on increasing people’s access to adequate and safe water and improved hygiene through not only infrastructural improvements but also transfer of knowledge and development of skills of the people. In implementation of the project, it applies a community-driven approach in which beneficiaries themselves play an important role in identifying the issues they face and the activities they want to have carried out. Through this approach, communities are encouraged to lead in assigning priorities, in decision-making and in taking action. Their skills are built and know-how improved, as they move along the project. The community within UN-Habitat targeted villages and surrounding areas will access to adequate and safe water and improved hygiene through not only infrastructure improvements but also transfer of knowledge and development of skills of the people by means of hands-on training. Capacity building trainings such as Community Action Planning (CAP), Village Development Committee (VDC), Bio-sand Filter construction, Household latrine and Concrete Tank (HH cistern) construction, Rainwater Collection Tank construction, Water Quality Testing and Surveillance, Operations & Maintenance and Exchange Tours, Book-keeping and financial management forms part of VDC training will be conducted for local people to implement the project activities and for sustainable development. Water infrastructure such as Tube wells, Rain water collection/storage tank, Pond, Hand dug well, Mini-dam/reservoir, Sub-surface dam/sand dam, River water supply system and water treatment plant with pumps, Gravity flow pipe water supply installation systems, road access to water sources will be constructed/renovated. Sanitation infrastructure such as household fly proof latrine and school latrine will be constructed.